Narooma Rotary Beacon 11 April 2019 – Narooma Rotary Club Inc. This Thursday is the club’s annual Pride of Workmanship Awards, one of the most prestigious nights in our Club’s calendar. President Rod will be presenting 10 awards to employees nominated by their employer because of their outstanding approach, attitude, dedication and commitment to their job. There will be 50 people all up, including Rotarians. Lynda Ord will be our MC. Should be a great night. It’s normal time – 6 for 6.30pm. Cost is $35 for a two-course meal (choice of two dishes each course). Ang Ulrichsen and Sandra Doyle with Narooma High students at RYDA last Tuesday. 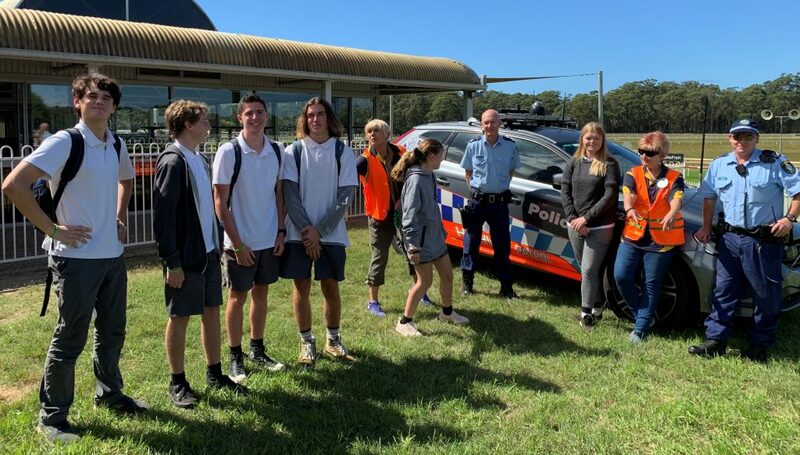 Sandra Doyle gave an interesting account of their day with students from Narooma High last Tuesday for the Rotary Youth Driver Awareness (RYDA) at Moruya Jockey Club. Sandra, Ang Ulrichsen and Geoff Robin were our representatives. Batemans Bay students were also there that day. This was the second day of this year’s RYDA. All up, 240 Year 11 students attended this year from the Eurobodalla’s five high schools. There were six different sessions presented by qualified and experienced presenters to small groups of students. This is the 12th year RYDA has been held as a joint project of the Eurobodalla Rotary Clubs; during that time more than 2,200 local students have benefited. Our presenters come from Rotary, two local learn-to-drive schools, NSW police, Eurobodalla Shire Council or the community. Lunch for everyone is donated and prepared by Moruya Rotarians. It is truly a joint effort! Neil Simpson also managed to get extensive media coverage for RYDA; it was also a great promotion of Rotary. He said nearly 50,000 students across Australia and New Zealand are expected to attend a RYDA course this year organised by Rotary. While there are several different driver education courses available, he said RYDA is considered best practice, most current and very relevant to learner drivers. The next local RYDA is 30-31March 2020. An added bonus last week was welcoming back from Antarctica and Galapagos Islands our much travelled Charmaine White. She gave an impromptu talk about her travels. Fascinating. Do you know anyone from one of NSW Emergency Service Agencies who perform Community Service above and beyond the call of their normal duties? Nominees must be appointed as paid or unpaid (volunteer) members of either Fire + Rescue NSW, Marine Rescue NSW, NSW Ambulance Service, NSW Rural Fire Service, NSW State Emergency Service or the Volunteer Rescue Association. Check out Tuesday’s email from Bob Aston for more information. Laurelle Pacey will talk about how Narooma has remembered those who have gone to war over the years. Please bring your friends!